The outlaw Jesse Woodson James killed the actor John Wilkes Booth at the Grand Avenue Hotel in Enid, Oklahoma in 1903 after Booth continually reneged on his oath to never talk about his secret membership in the Masonic-oriented Knights of the Golden Circle (KGC) and to never mention the murder of Abraham Lincoln. His own granddaughter Izola Forrester affirmed in her 1937 book This One Mad Act that Booth had been aided and abetted in his escape from Washington by the KGC. It was common knowledge in the Booth family that he never died in the barn. The man shot and killed in Garrett’s barn was James Boyd, a former confederate agent working for the War Department. He bore a passing resemblance to Booth aside from his red hair and moustache. Booth’s hair was jet black and he had shaved off his moustache at the home of Dr. Samuel Mudd shortly after escaping from Washington. Not a single friend of Booth was called to the inquest to identify the body. A Washington doctor named John May had removed a tumor from Booth’s neck several months prior to the Lincoln assassination and was summoned to view the corpse. When the blanket covering the body was removed May stated, ‘There is no resemblance in that corpse to Booth, nor can I believe it to be him.’ May later changed his statement to conform with the official proclamation that Booth had been captured and killed. In 1922 two Civil War veterans swore an affidavit stating that the body removed from the Garrett farm was not Booth. Joseph Zeigen and Wilson Kenzie said that they had served with the cavalry troop which had surrounded the barn. The man dragged from the barn wore a Confederate uniform and on his feet were yellow brogans, the service footgear of Johnny Reb. The two veterans were sworn to secrecy. In 1872 St. Helen was operating a distillery in Glen Rose, Texas where he ran afoul of revenue agents over whiskey taxes. He hired attorney Finis Bates to represent him. Bates, the grandfather of Hollywood actress Kathy Bates (Fried Green Tomatoes, Misery etc. ), would later write a book about his friendship with St. Helen. 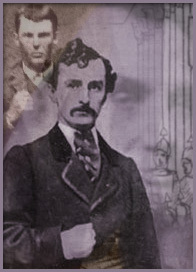 One day after contracting a virulent flu, St. Helen was sure that he was going to die and called Bates to his bedside wherein he confessed that he was not John St. Helen at all, but rather John Wilkes Booth, the assassin of Abraham Lincoln. Bates was highly sceptical until St. Helen gave him a photograph of himself for future identification purposes. After making a full recovery from his ailments St. Helen begged Bates to hold his confession in strict confidence. Booth’s heavy drinking combined with his continual boasting of exploits within the KGC eventually brought him to the attention of Jesse James. This was particularly so when Booth was ‘in his cups,’ which was more often than not, according to friends in Enid. It was also reported that Booth regularly partook of laudanum, an opium derivative. This is when he would become particularly verbose. The outlaw Jesse James was not killed by Bob Ford in 1882. Jesse faked his death as an expedient way to throw off Pinkerton agents, assorted railroad barons, gun fighters trying to establish their bona fides and the dozens of bounty hunters scouring the country for James in order to claim the various rewards offered for his capture. He and Ford would go on to be partners in many business ventures spanning decades. James operated under more than 50 aliases in his long life before dying at the advanced age of 107 under the alias J. Frank Dalton in 1951 in Lawton, Oklahoma. Jesse was a 33rd degree Freemason and a high-ranking Knight of the Golden Circle. The KGC evolved from a Scottish secret group known as The Society of the Horseman’s Word, otherwise known as the Horse Whisperers. This fraternity recited passages from the Bible backwards and practised folk magic as part of their rituals, in addition to having Masonic-style oaths. Headquarters for the Knights of the Golden Circle was 814 Fatherland Dr. in Nashville. This was the home of KGC operative Frank James, elder brother of Jesse James. Years later it became the Dixie Tabernacle, original home of the Grand Ole Opry. The KGC claimed 200,000 members all over America during the war. All of the men in Lincoln’s cabinet were Knights, save for Lincoln. The KGC was heavily financed by the London and Paris Rothschild brothers. Their goal was to foment as much chaos and discord as possible in order to keep the country divided and to usher in a Rothschild-owned central bank. But Lincoln had his own plans. During his presidency his 50% tariff jump-started the American steel industry, while his railroads, subsidies for mining, free land for farmers and free state colleges transformed a bankrupt cotton-exporting country into the world’s greatest industrial power within 25 years. Lincoln knew that he was waging a separate but equally brutal war against Rothschild-dominated Wall St. firms with his attempt at reasserting government control of credit. He put through anti-usury and other strict banking laws, sold bonds directly to the people and issued hundreds of millions of national currency. With these reforms The Great Emancipator had signed his own death warrant. During the Civil War Lincoln negotiated a pact with Czar Alexander of Russia whereby the Russian Navy was sent into the ports of San Francisco and New York to help block the Rothschild ships that were running armaments to the South. After the appearance of the Russian ships in American waters the Rothschilds cancelled contracts to build more blockade running boats. The Czar won the day for the North as Russia promised to go to war with any nation that attacked America. One of the ships anchored in New York Harbor was the Russian frigate Osliaba. Harpers Weekly carried drawings of the ship in one of its 1863 issues. Civil War photographer Mathew Brady took numerous photographs of the Russian ships. And on October 5, 1863 the city of Baltimore issued a proclamation thanking the Czar for his assistance. In 1867 when the war ended and Lincoln was dead, President Andrew Johnson received a bill in the amount of $7.2 million for the rental of the Russian fleet. The Constitution forbids giving tax dollars to any foreign nation for any reason whatever except for the purchase of land. Johnson directed Secretary of State William Seward to purchase Alaska from the Russians for $7.2 million. These details of ‘Seward’s Folly’ have been excised from the historical record. This is because Imperial Russia was the only European country without a central bank. They were the greatest foes of the Rothschild Syndicate. Also, since the time of the Empress Elizabeth, Russian Jews had been confined to an area known as the Pale of Settlement. Jews could not live beyond the Pale. Long ago attempts were made to remove all Jews from Russia entirely unless they converted to the Orthodox Church. The Pale of Settlement was the next best solution. The Rothshchilds underwrote the Bolshevic Revolution of 1917. The murder of Czar Nicholas and his family was their revenge for the treatment of their co-religionists in times past and for daring to stand against the inauguration of a Rothschild dominated central bank. And the Rothschilds also underwrote the financing of the Knights of the Golden Circle. Their gold and dollars were laundered through a Montreal bank by Rothschild asset and Confederate Secretary of State, Judah Benjamin, ‘the brains of the revolt.’ Benjamin was running so many Confederate spies out of Montreal that it was known as ‘the second Richmond.’ Benjamin was very wealthy and owned a sugar plantation manned by 140 slaves. After the war he fled Richmond and eventually wound up in London, England where he made a very comfortable living as a Queen’s Counsel. It is difficult to get data on Benjamin as he burned his personal notes so frequently that one historian referred to him as a ‘virtual incendiary.’ At his death he left 6 scraps of paper. He left no articles or essays on his role in the Civil War. Although he did pen a letter to the Times of London in 1883 refuting charges that millions of Confederate dollars were left in European banks under his control. After the Lincoln assassination police found decoding sheets in Booth's Washington hotel room. A matching coding device was found in Benjamin's Richmond office. Jesse tracked Booth to the Grand Hotel in Enid one winter evening in 1903. Jesse made Booth drink a large glass of lemonade laced with a copious quantity of arsenic. Booth drank the lemonade and quickly expired. Jesse scattered many of Booth’s papers around the corpse for easy identification. He then went down to the hotel lobby and gave the manager a gold coin and asked him to look in on his friend David George in the morning, as George was feeling ill. The next day the press had a field day. The story exploded. Thousands of reporters came to Enid from all over the country to report the death of John Wilkes Booth. Booth’s body was taken to a mortuary across the street from the hotel that was owned by WB Penniman. Many people identified the corpse as Booth including a retired couple named Harper whom Booth had confided in. Penniman laid Booth out in his mortuary and charged curiosity seekers 10 cents a peek. Tourists viewing the corpse would steal the collar buttons and sometimes remove locks of hair for souvenirs. One intrepid visitor tried to sever one of the mummy’s ears with a pocket knife. But when the drawing power of the Booth mummy waned Penniman handed over the body to Finis Bates who had claimed it from the very beginning. Later on, Bates rented out the body to carnivals and sideshows. The corpse travelled for years as part of a show featuring freaks and strange animals. It even emerged unscathed from a circus train wreck that killed eight people. At one point the mummy was even kidnapped and ransomed. In 1931 it turned up in Chicago where a group of doctors performed an autopsy and took an x-ray and pronounced its Booth-like injuries authentic. In 1932 a couple named Harkin bought the mummy and displayed it from the back of their truck. Hecklers would sometimes claim that the mummy was made out of wax, but Mrs. Harkin silenced them by rolling the mummy over and opening a flap on its back that had been cut away during the original autopsy. The mummy wore nothing but khaki shorts and between shows Mrs. Harkin would lacquer the skin with Vaseline and comb its hair. The mummy vanished from the public eye in the 1950s.